Trying new restaurants is probably in my top five favorite things to do. It’s no secret that I love to eat and I love to eat at new places. That brings me to Boundary Sports Bar and Grille at the Fairmont Southampton. 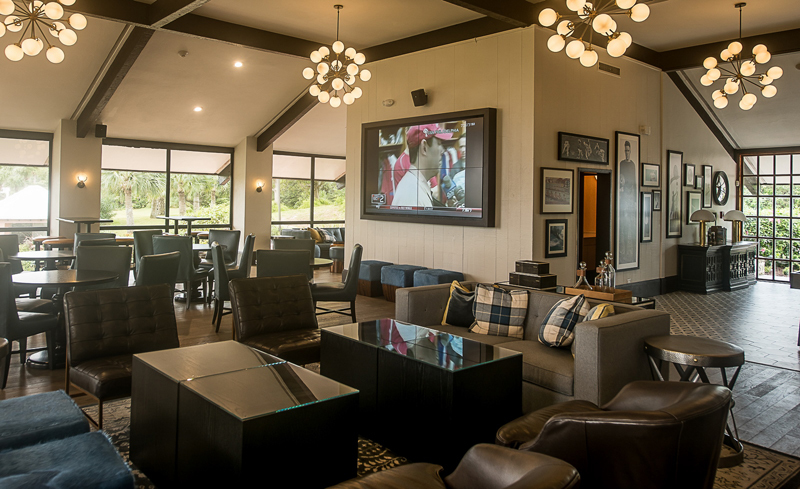 Boundary is Bermuda’s newest restaurant, promising a unique sports bar experience. It was first on my list for Restaurant Weeks for obvious reasons. Also, it’s in the $32 category [PDF of menu] and this category is always my favorite because I like to see how creative restaurants will get at this low price point. So let’s talk about the food. Honestly, I was expecting a home run because the restaurant is new and because it’s a Fairmont restaurant. And I have to say, Boundary hit it out the park. I started with the 9 Iron Chili, which had nine types of beans, hominy and vegetables served with a side of jalapeño cornbread. This chili was salty, smoky, with a bit of kick and also a fresh bite thanks to a sprinkling of scallions on top. The cornbread was salty, buttery, light and spicy all at once. I appreciated seeing a vegetarian option on the menu and a good one at that. Definitely order this chili when you go to Boundary. 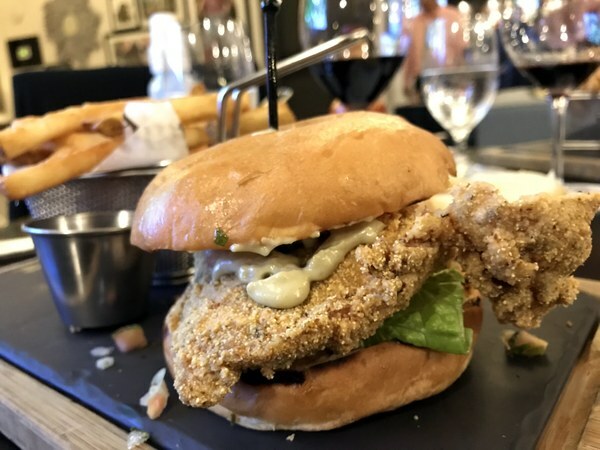 For the mains, I went for the Angler’s Catch – a cornmeal crusted snapper sandwich with avocado aioli and pico de Gallo on brioche. The sandwich came with a side of fries. The bun was soft and buttery while the fish had great crunch to it and was well seasoned. I’d never had avocado aioli on a fish sandwich before and I really liked it. The pico de gallo added a bit of tang to the dish. Overall, it was a great, non traditional fish sandwich that I would happily order again. Oh, and the fries were delicious – super crispy on the outside and soft in the inside. For dessert, I had the Iron Cookie – a warm chocolate chip cookie with a scoop of vanilla ice cream. The cookie was crispy but gooey at the same time, which is the perfect kind of chocolate chip cookie in my world. It also had a caramel sauce on the top which added more goo to the mix. This wasn’t a sophisticated dessert by any means, but it was the perfect dessert to have at a sports bar after a casual, delicious meal. So please take my advice and head over to Boundary Sports Bar and Grille soon before everyone knows about it. The atmosphere is great, the food is great and there’s also a great wine list with cool cocktails. Boundary was an excellent start to Restaurant Weeks. Stay tuned for more! Been thinking about giving this place a whirl, now I’m sold. Thanks Mikaela!